How can worms survive in an Aquaponic grow bed? Is this even possible? Aren’t they supposed to drown? You probably have seen worms crawling out the sidewalk under the heavy rain looking as if they were gasping for air. Seeing worms that choose to expose themselves under rays of sunlight and voracious birds compared to watered soil makes us think that worms abhor wet environment. This gives us the idea that worms, do not like to be soaked in an Aquaponic grow bed since it’s also wet. The difference with these kinds of worms is that they do not remain filled with water but rather they flood and drain permitting them to a dry out period in between soaking so it encourages air circulation in your grow media. 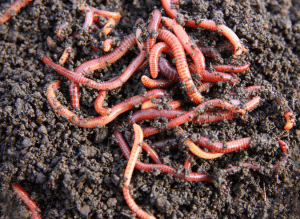 You can read this article for some tips on how to add worms in your system. This explanation leads me to the very reason why worms can survive in an Aquaponics system; the reason is simple, oxygen. The very reason why worms make their way out of the soil unto the sidewalk isn’t because of water, it’s because the water has removed the oxygen out of the soil. However, in an Aquaponics system, it not only floods and drains to pull oxygen straight into the grow bed media it also makes sure that the water that circulates all throughout the system is well oxygenated. Have you ever had a problem of having too many worms? No. All my fish wished there were too many worms but that won’t be possible. The truth is, worms regulate their own population to correspond to the conditions in their environment. So soon as the conditions do not support Aquaponic worms then their production slows down or ultimately they cease to reproduce. I am planning to create a system inside my home. Is there going to be a chance that they’ll escape? The answer would have to be a no. Worms abhor light and they are happiest when they are sheltered in the moist and dark areas of your grow bed. Perhaps the only time when you will get to see your Aquaponic worms is when you unearth your plants. Your Aquaponic worms would be happy to be intertwined with your roots and shoulder the responsibility of taking care of the sloughed off dead root materials. Someone once said that worms are carriers of E.Coli? Is there some truth to this? Definitely no. This is only a rumor and it is not true. How can I get worms to be in my grow beds? Well, you need to buy them from a dependable source like us. Our Aquaponic worms are drop shipped to you from a certified and legitimate facility. As soon as it arrives you can already add them to your grow beds. You can read an article from our website to get some tips on how much worm you can put in your system.